We are back once again to help you find the best dog food for Maltipoo puppies and older dogs so that your fluffy darling has healthy and tasty food everyday of the week. While not everyone knows the name of this adorable dog breed they will recognise a Maltipoo. They are that petite, prancing moptop of white fluffy fur you see pretty much everywhere, including in the arms of celebs like Rihanna and Jessica Simpson! The Maltipoo is actually a hybrid dog breed born of crossing a Poodle with a Maltese. This interesting cross gives the Maltipoo both high intelligence and its signature cuteness, making this one of the most popular hybrid pet dog breeds today. But the Maltipoo is generally a very small dog breed, typically weighing no more than seven pounds. Although, some Maltipoos can weigh up to 15 pounds if one parent is a standard Poodle. Evenso, this means it is a dog breed that can become overweight rapidly. This happens if overfed or fed the wrong diet, with a poor nutrient composition for small breed dogs. Plus, let’s be honest – it can be very, very hard to resist giving your cute Maltipoo extra treats! This makes the Maltipoo dog food you choose so very important for your dog’s health and lifespan! The best dog food for Maltipoo dogs is nutritionally balanced for small dog breeds, so that your Maltipoo gets maximum nutrition with zero unnecessary caloric intake. Let’s dive into an exploration of the best food for Maltipoo dogs and the best dog food for Maltipoo puppy dogs, senior Maltipoo dogs and Maltipoos with food allergies so you can pick a food brand you trust and feel good about! What is the best dog food for Maltipoo dogs? The Maltipoo dog breed is a cross bred or hybrid dog breed. In the case of the Maltipoo, one parent dog is a miniature or standard poodle and the other parent dog is a Maltese dog. This means your Maltipoo dog can weigh as little as four pounds or as much as 15 pounds as an adult! The smaller the dog, the more frequently feedings may need to occur in order to maintain a stable metabolism, energy and blood sugar level. Be sure to talk with your veterinarian about whether two or three daily feedings is best for an adult Maltipoo who is very petite. 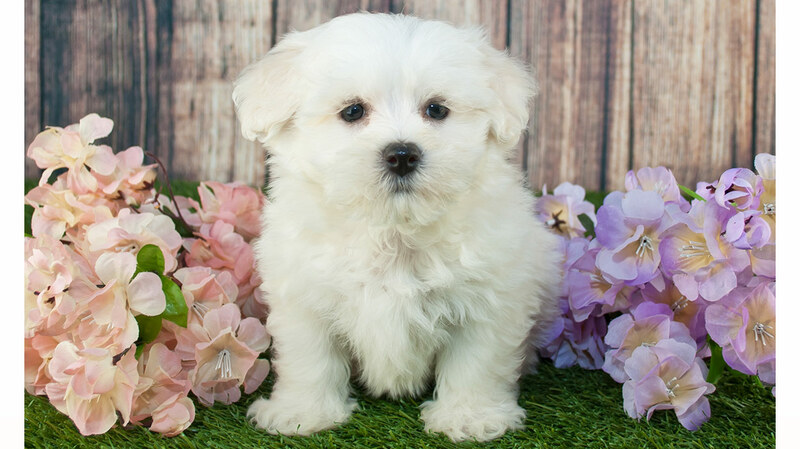 For a Maltipoo puppy, you should continue with the feeding schedule and food brand or type set up by your breeder (with feedings done typically every two hours or so) unless your veterinarian specifically advises otherwise. This will help your Maltipoo puppy make the smoothest and happiest transition to her new “forever” home with you. That it is free from fillers, by-products and artificial ingredients or preservatives. The food features a small kibble size easy for your small dog to pick up and chew. You want dog food packed with protein, vitamins, minerals and nutrients. Easy to digest by your pet and contains prebiotics and/or probiotics. The first ingredient in the food is real whole meat protein. Ideally, the food is specifically designed for the nutritional needs of small and/or toy breed dogs. The best dry dog food for Maltipoo dogs will all have some aspects in common: high quality, whole food ingredients, plenty of vitamins and minerals, small kibble size, no fillers and packed with nutrition. But you should also be prepared for the fact that your Maltipoo might not like his new food as much as you like it! In other words, just as you might have different food preferences than others in your family, your Maltipoo may not like the same dry food as the Maltipoo living next door. When trying out a new Maltipoo food purchase the smallest package size until you are sure your Maltipoo loves it. This way, you could save some money better spent on dog toys. Holistic Select Natural Grain Free Small and Mini Breed Dry Dog Food This popular and highly rated small and mini breed dry dog food features a small kibble size, a grain free recipe and a protein to fat ratio that caters to the energy needs of smaller breed dogs. Bag sizes start at 4 pounds. Taste of the Wild Grain Free High Protein Natural Dry Dog Food for Small Breed Dogs. This highly popular grain free small breed dog food features real venison as the primary protein source. It is a high protein, nutritionally balanced food that is free from grain, fillers, wheat, artificial ingredients, and preservatives. The recipe includes antioxidants, essential fatty acids and plenty of vitamins and minerals. Bag sizes start at 5 pounds. Instinct Raw Boost Grain Free Recipe Natural Dry Dog Food by Nature’s Variety for Small Breed Dogs. You can choose between chicken and duck for the main protein source. The recipe is grain-free and free from soy, potato, wheat, corn, by-products, fillers, artificial ingredients or preservatives. The kibble is freeze-dried raw protein with extra calcium and phosphorus added for healthy, strong bones and teeth. Bag sizes start at 4 pounds. Wet food can and (in most cases) should be a healthy part of your Maltipoo’s diet. But since wet food tends to be more caloric and less nutrient-rich overall, the best dog food brand for Maltipoo dogs will be a wet food that is packed with nutrition for small breed dogs. Wet food can be great in your Maltipoo’s diet when you bring your new puppy home since it is highly palatable. Many puppies may stop eating for a day or so due to the stress of the transition. If this happens, offering some wet food on the tip of your finger can help your new Maltipoo pup relax and start eating again! Hill’s Science Diet Adult Small & Toy Ground Entrees Wet Dog Food. This protein-rich wet food recipe helps you to manage your Maltipoo’s weight and continue to help your pint-sized pup develop lean muscle mass. The chicken and barley formula is easy on the digestion and offers a full complement of vitamins and minerals. You get 24 5.8-ounce cans in an order. Solid Gold Holistic Wet Dog Food for Small & Toy Breeds. This grain-free, gluten-free wet dog food recipe is specifically designed to meet the nutrient needs of small and toy breed dogs. Choose from three recipes: lamb, chickpea and pumpkin; lamb, sweet potato and cranberry; turkey and hearty vegetables. All three recipes are free from corn, soy and wheat and come with a full range of vitamins and minerals. You get 12 3.05-ounce cups of wet dog food in an order. Merrick Classic Grain Free Small Breed Canned Dog Food. This small breed wet dog food has deboned real protein as its first ingredient. It is grain-free and free from all artificial ingredients. You can choose from three recipes: cowboy cookout (beef),; Thanksgiving day dinner (turkey); Grammy’s pot pie (chicken). The wet food is cut up into smaller pieces for small canine mouths to enjoy easily. You get 24 3.2-ounce cans in an order. The senior years can be a time when some Maltipoo dogs become more sedentary and begin to gain some extra weight. 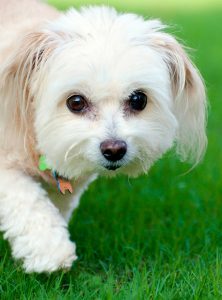 For this reason, you may want to transition your senior Maltipoo to a lower calorie food that matches a lower activity level. Maltipoo seniors benefit from Maltipoo food that is enriched with extra nutrients like glucosamine and chondroitin for joint support. AvoDerm Small Breed Senior Health Grain Free Dog Food. This recipe is specially designed to meet the needs of senior small breed dogs. It contains extra nutrients like DHA, glucosamine and chondroitin and natural avocado oils for skin and coat health. Bag sizes start at 3.5 pounds. NUTRO Ultra Small Breed Senior Dry Dog Food. This special senior blend features wholesome ingredients with three protein sources: lamb, chicken and salmon. There is no wheat, soy or corn, no GMOs, no by-products and no artificial ingredients. Bag sizes start at 4 pounds. EUKANUBA Senior Dry Dog Food for Small Breed Dogs. This special senior dog recipe includes prebiotics, essential fatty acids, beet pulp and antioxidants. These help to support a healthy immune system and gastrointestinal system. This food is nutritionally balanced to help with weight management, energy and skin and coat health. Bag sizes start at 5 pounds. The best food for Maltipoo puppy dogs can vary depending on what your breeder or shelter was feeding your puppy. Often, it is best to continue feeding your Maltipoo puppy the same food unless your veterinarian feels strongly otherwise. If you want to transition your Maltipoo puppy to a new food it is a good idea not to make a sudden transition. It is better to mix part of the old food with the new food for a week or so. Do this until your Maltipoo puppy really feels comfortable with and accepting of the new food. Wellness Complete Health Natural Dry Small Breed Dog Food for Puppies. This is one of best puppy food for Maltipoo puppies as it is nutritionally complete and balanced and comes with added DHA, essential fatty acids, fish oil, vitamins and minerals plus real turkey, salmon and easy-to-digest oatmeal. Hill’s Science Diet Small & Toy Breed Dry Dog Food for Puppies. Hill’s Science Diet has been a vet-recommended staple for decades and easily one of the best dog food brands for Maltipoos, particularly for the smaller guys. This recipe features easy-to-digest chicken meal and barley with vitamins, minerals, amino acids, fish oil and DHA. Also, it has no artificial ingredients or fillers. Bag sizes start at 4.5 pounds. BLUE Life Protection Formula Dry Puppy Food. This popular and highly rated puppy food comes in several recipes. They include chicken and brown rice, chicken and oatmeal and lamb and oatmeal. This puppy food is free of known allergens like corn, wheat, dairy, soy, by-products, artificial flavors, preservatives or fillers. It is packed with vitamins and minerals to support your puppy’s growth and development. Bag sizes start at 6 pounds. Maltipoos can develop food sensitivities and food allergies just like people can! When you and your vet are not yet sure what might be causing your Maltipoo’s food allergies, one good approach is to feed a limited ingredient diet (L.I.D.). Eliminate all but two or three ingredients and see if your Maltipoo’s health symptoms disappear. Some dog food brands also offer dog food specifically prepared for sensitive digestive systems. This can also be a good path to see if you can ease your Maltipoo’s digestive distress. Nature’s Recipe Grain Free Dry Dog Food. This all-natural grain free dog food has real whole chicken as its first ingredient and the rest is an easy-to-digest blend of pumpkin and sweet potato. The recipe is designed to serve the nutrient needs of dogs 25 pounds and smaller. Bag sizes begin at just 4 pounds. Merrick Lil Plates Grain Free Small Breed Recipe. This special grain-free recipe is also free from gluten, a known digestive allergen for some dogs. You can choose from four blends, each with one whole protein source lamb, beef, chicken or salmon. They also have a vegetarian sweet potato which is very easy on the digestion. Bag sizes start at 4 pounds. Natural Balance Limited Ingredient Dry Dog Food. This limited ingredient diet (L.I.D.) food comes in several recipes, including duck and potato, chicken and sweet potato and lamb and brown rice. All are easy on the tummy and grain-free. Bag sizes start at 4.5 pounds. We hope this list of the best Maltipoo puppy food, adult dog food and senior dog food was helpful! You will not be able to go too far wrong feeding your lovely Maltipoo if you know their needs and follow the advice of your local vet. We hope your little Maltipoo enjoys our recommendations! If there is any food we have missed or anything you would like to add, please leave us a comment. We would love to hear from you.